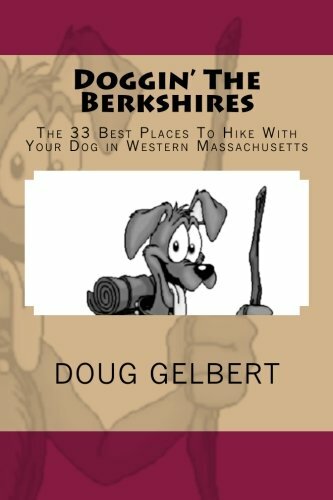 The Berkshires are a great place to hike with your dog. Within a short drive you can be scaling mountains that leave your dog panting, exploring impossibly green glens that will set tails to wagging or circling lakes for miles and never lose sight of the water. Your dog will plenty of superb swimming,both in the plunge pool and further downstream. After hiking the two-mile loop up to the Appalachian Trail through a blend of active pastures and woodland your dog will be asleep on the ride home. There are no traces of its time as a recreation destination, only airy hemlock and mixed hardwood forest where your dog will enjoy sweeping ups and downs and energetic streams. The 2.8-mile trek up Alander Mountain starts with as many drops as climbs but eventually your dog will be rewarded with 270-degree views. The hike with your dog through Ice Glen may be only a quarter-mile long but it plays bigger with boulders littering the ravine floor. You dog will relish the cool shade of some of New England’s largest pines and hemlock trees. You can take your dog on the same hike that took place on August 5, 1850 when two giants of American literature, Herman Melville and Nathaniel Hawthorne, met for the first time. The star trails at Field Farm are the trips through airy pastures with views of the Taconic Range to the west and Mount Greylock to the east. When your dog takes the 1.5-mile Benedict Pond loop the calm waters are in sight almost the entire way. Whatever you have in mind for hiking with your dog is on the menu at Notchview - there are more than 15 miles of paw-friendly trails here when the snow is not on the mountain.